This blog post is a little unplanned, especially as I sat down at my desk with the intention of writing one of the post ideas I already had, written in my illegible scrawl in a notebook beside me. But, there was no subject I wanted to write about. No books I had read recently that I could use for a feature, or interview collecting dust in my neglected email inbox. Instead, my thoughts, as they have been since I turned those final few pages, were on Of Mice and Men, which I finished late last night. As you all may know, me and classics have had a love/hate relationship since I read To Kill a Mockingbird last year in school. All I'd heard was how important this book was, whether the themes or characters were being discussed. I was expecting for it to be a new favourite of mine: and it wasn't. 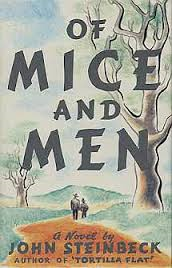 With the recent controversial decisions that have been made by Michael Gove(which I wrote a post about here), I was really excited to get the chance to form my own opinion on Of Mice and Men, despite my past experiences with classic novels. To sum up my thoughts in a few words, I loved it. Of Mice and Men has definitely had a huge impact on my feelings towards similar types of books; both by US and UK authors. If you have read Steinbeck's novel in the past, you're probably aware of the numerous themes involved in the book, such as friendship and dreams. In a setting such as the 1930s, there was very little of this, and the relationship between our two main protagonists, George and Lennie, was just so heart-warming to witness. The more serious topics it deals with include sexism and racism; and what stood out to me was one of the characters - the only women - was referred to as Curley's wife. Not by a name but, as her husband's wife. As women had no right to an identity in these times, they belonged to someone else. Even before I read this book, I knew that racism would also play a part, as what else do you expect from one set in America at this time? Steinbeck tackled it with both honesty and brutality though, and he wrote with no restraints. His writing, his words, you could take on any subject. If you are familiar with Of Mice and Men, you'll know the ending. How it will leave you clinging on, believing that it is not the end. How it will leave you with tears in yours eyes. And, most importantly, how it will leave you desperate for a sequel. Since summer is currently approaching(only one more month left in school! ), I've decided that it's time I read a few more of the most celebrated books in literature; and these are the ones I will be reaching for first, especially now that my exams are over. There are a lot more I'd like to try though, such as popular childhood classics. 1984 by George Orwell - I can almost hear you let out an exasperated sigh. I know. I still haven't picked this book up yet; despite months of it sitting on the top of a pile of books waiting for me to open it. I'm a huge fan of dystopia novels and 1984 was the original one. Orwell was the first to dare, not to only think, but write and publish his ideas for what the future may become. From the idea of Big Brother and the Thought Police, I can already feel the shivers creeping down my spine. This is, no doubt, my next read. Fahrenheit 451 by Ray Bradbury - Named after the temperature that paper burns, this is a dystopia that writes the worst nightmare of any avid reader; a world where books are forbidden. I, for one, am so intrigued by this idea, where people are so scared of knowledge they are forced to burn the source of it. It's terrifying. The Bell Jar by Sylvia Plath - After hearing endless praise from Ruby(Feed Me Books Now), I managed to find a copy, and it seems to echo what I love most about my favourite modern-day contemporary novels. There's something so interesting about a novel like The Bell Jar; and it's plot seems to slightly match a lot of experiences people have today. So, have you read 'Of Mice and Men'? What did you think? Are you planning to read any new ones in the future? Such a beautiful review, Sophie! We started studying this in class today, and while my class did guided reading up to page thirty, I went through the whole book and just sat crying for the rest of the lesson... the ending was so sad. It's a really beautiful, raw and powerful book! Also, aaah! Read 1984 asap :D It's so good. 1984 is such an amazing book, you will love! So is The Bell Jar .... ugh. This post is full of depressing books isn't it?? I've not read Fahrenheit 451 but I probably will at some point. in answer to your question: my favourite classics include Pride and Prejudice, Emma, Sense and Sensibility (all by Austen), Of Mice and Men, Rebecca and The House on the Strand (both by Daphne du Maurier), 1984, Animal Farm, Brave New World, Adam Bede, Jane Eyre, Wuthering Heights, Lord of the Flies ... and it goes on! I'm going to read Persuasion, The Great Gatsby and Great Expectations this summer, among others.